Laser pointer is used to test and compare the accuracy of different camera stabilizers. We have different stabilizers, but the method of comparison must be based on measurable values and repeatable conditions. Most often, art cinematography is used for demonstrating the operation of camera stabilizers. However, in this case, it's hard to distinguish between the work of a good cameraman and a good camera stabilizer. That's why we need better criteria for comparing the quality of operation of camera stabilizers. 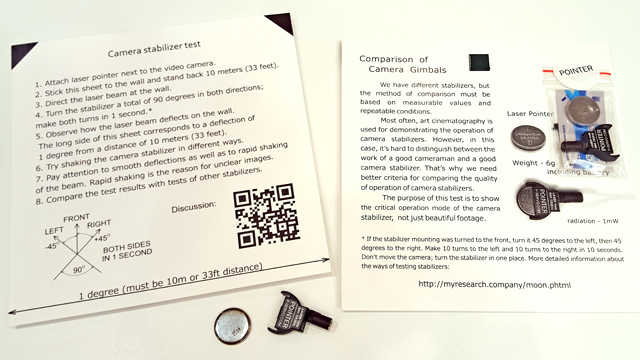 The purpose of this test is to show the critical operation mode of the camera stabilizer, not just beautiful footage. Weight - 6g including CR2032 battery, radiation - 1mW. Laser pointer allow to find and compare a real accuracy of the stabilizer. As a matter of fact, the real accuracy of some popular stabilizers is one hundred times worse than declared in manual. 1. Attach laser pointer next to the video camera. 2. Stick this sheet to the wall and stand back 10 meters (33 feet). 3. Direct the laser beam at the wall. 5. Observe how the laser beam deflects on the wall. The long side of this sheet corresponds to a deflection of 1 degree from a distance of 10 meters (33 feet). 6. Try shaking the camera stabilizer in different ways. 7. Pay attention to smooth deflections as well as to rapid shaking of the beam. Rapid shaking is the reason for unclear images. 8. Compare the test results with tests of other stabilizers. * If the stabilizer mounting was turned to the front, turn it 45 degrees to the left, then 45 degrees to the right. Make 10 turns to the left and 10 turns to the right in 10 seconds. Don't move the camera; turn the stabilizer in one place.